The CM Punjab have approved the Quick Response medical staff jobs in all big cities of Punjab where the ambulance is hard to go. The small streets and roads with heavy traffic and rush have the problems where medical staff response is mostly high. 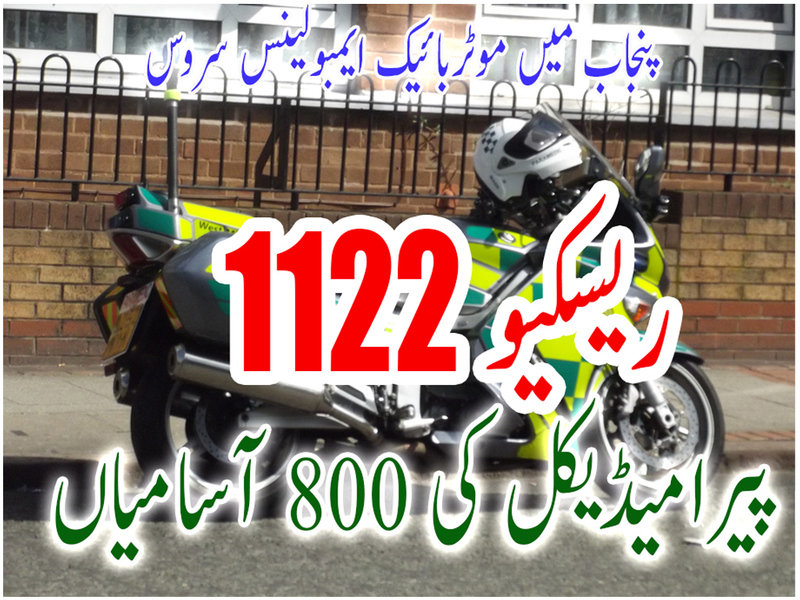 This motorcycle ambulance with give first aid to the RTA, Medical and short injured patient. This is a great view in big cities. The new jobs 2017 for EMT’s have been announce on December 2016 for big cities of Punjab including Lahore, Rawalpindi, Multan (100), Gujranwala, Faisalabad, Bahawalpur, Dera Ghazi Khan, Sargodha and Sahiwal districts. 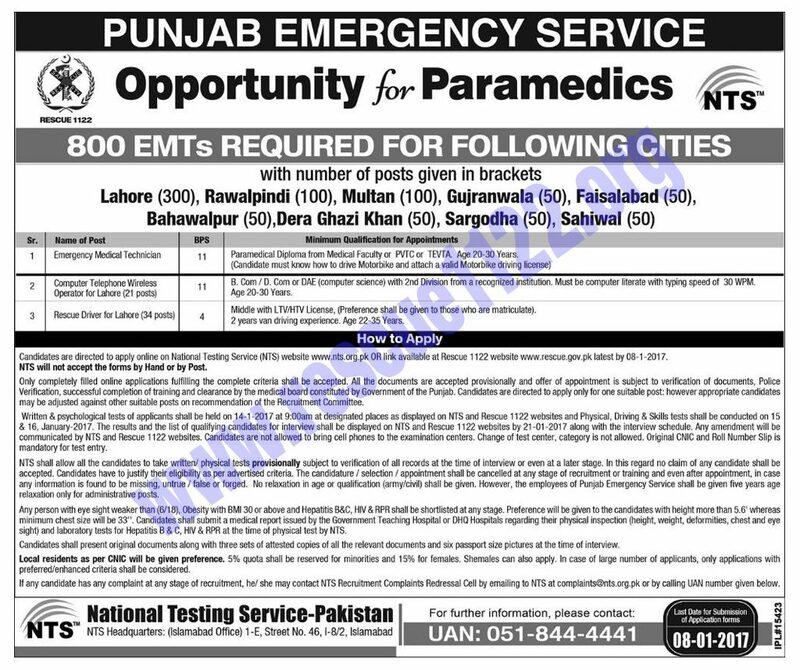 The new 800 emergency medical Technician jobs 2017 have been announced in Punjab Emergency service Rescue 1122 with great thinking for poor public have lot of issues to go for hospital. The last date to apply for these new jobs 2017 is 08-01-2017 (8th January 2016) by NTS (National Testing Service). The written test and Physical test dates will be announce later after application submission and evaluation. The Interview for these Rescue 1122 Jobs 2017 by Punjab Emergency Services will be announced later. See here complete detail of Rescue 1122 Motor Bike EMT Paramedics Jobs 2017 by NTS with advertisement. 11 B. Com / D. Com or DAE (computer science) with 2nd Division from a recognized institution. Must be computer literate with typing speed of 30 WPM. Age 20-30 Years. 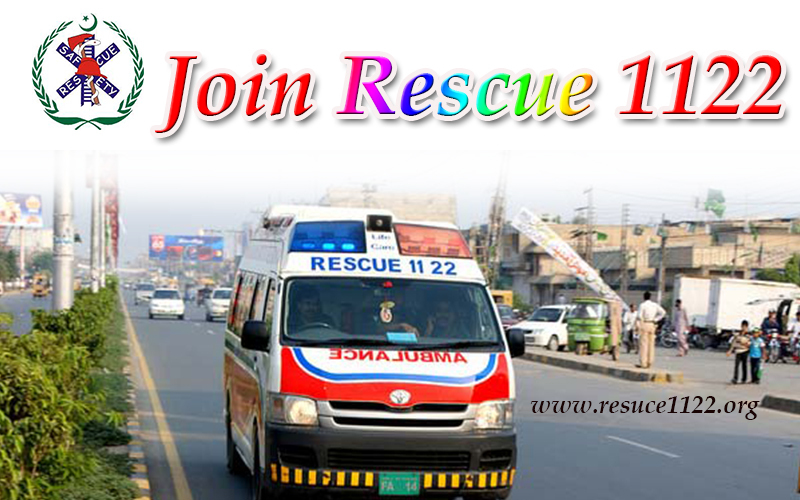 3 Rescue Driver for Lahore (34 posts) 4 Middle with LTV/HTV License, (Preference shall be given to those who are matriculate). 2 years van driving experience. Age 22-35 Years. Candidates are directed to apply online on National Testing Service (NTS) website www.nts.org.pk OR link available at Rescue 1122 website www.rescue.gov.pk latest by 08-01-2017 (8th January 2016). NTS will not accept the forms by Hand or by Post. Only completely filled online applications fulfilling the complete criteria shall be accepted. All the documents are accepted provisionally and offer of appointment is subject to verification of documents, Police Verification, successful completion of training and clearance by the medical board constituted by Government of the Punjab. Candidates are directed to apply only for one suitable post: however appropriate candidates may be adjusted against other suitable posts on recommendation of the Recruitment Committee. Written & psychological tests of applicants shall be held on 14-1 -2017 at 9:00am at designated places as displayed on NTS and Rescue 1122 websites and Physical, Driving & Skills tests shall be conducted on 15 & 16. January-2017. The results and the list of qualifying candidates for interview shall be displayed on NTS and Rescue 1122 websites by 21-01-2017 along with the interview schedule. 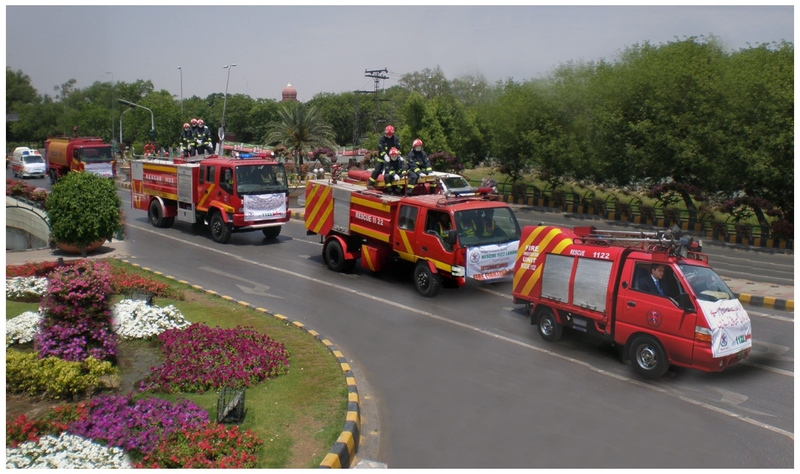 Any amendment will be communicated by NTS and Rescue 1122 websites. Candidates are not allowed to bring cell phones to the examination centers. Change of test center, category is not allowed. Original CNIC and Roll Number Slip is mandatory for test entry. NTS shall allow all the candidates to take written/ physical tests provisionally subject to verification of all records at the time of interview or even at a later stage. In this regard no claim of any candidate shall be accepted. Candidates have to justify their eligibility as per advertised criteria. The candidature / selection / appointment shall be cancelled at any stage of recruitment or training and even after appointment, in case any information is found to be missing, untrue / false or forged. No relaxation in age or qualification (army/civil) shall be given. However, the employees of Punjab Emergency Service shall be given five years age relaxation only for administrative posts. Any person with eye sight weaker than (6/18), Obesity with BMI 30 or above and Hepatitis B&C, HIV & RPR shall be shortlisted at any stage. Preference will be given to the candidates with height more than 5.6′ whereas minimum chest size will be 33″. Candidates shall submit a medical report issued by the Government Teaching Hospital or DHQ Hospitals regarding their physical inspection (height, weight, deformities, chest and eye sight) and laboratory tests for Hepatitis B&C, HIV & RPR at the time of physical test by NTS. Candidates shall present original documents along with three sets of attested copies of all the relevant documents and six passport size pictures at the time of interview. Local residents as per CNIC will be given preference. 5% quota shall be reserved for minorities and 15% for females. Shemales can also apply. In case of large number of applicants, only applications with preferred/enhanced criteria shall be considered. If any candidate has any complaint at any stage of recruitment, he/ she may contact NTS Recruitment Complaints Redressal Cell by emailing to NTS at complaints@nts.org.pk or by calling UAN number given below.